Oatley Electronics has updated their K282 RIAA phono preamp kit! The new kit now has a discrete power supply in place of the original SMPS. 110/240 VAC is supplied direct to the PCB instead of a wall wart. Check out the NEW Oatley K301 kit! I've got stacks of vinyl I haven't heard for years simply because I didn't have phono in jacks on my Pioneer surround amp and no descent phono pre-amp to use. The FireFly is still on my project board. This phono preamp is just a little side track. Thanks for the heads up on this kit. Mark, have you had a chance to try out this new kit? Doesn't mean I wont find a way to do it otherwise. The only problem I have with the integrated PS otherwise is the use of old school "brute force" regulation. The design is not particularly immune to ripple. My plan with this is to design an LM317T based regulator with enhanced ripple rejection. I've been able to accomplish super quite power supplies using the LM78xx, but I haven't tried that with the 317 and the 78xx series does not go above 24VDC. 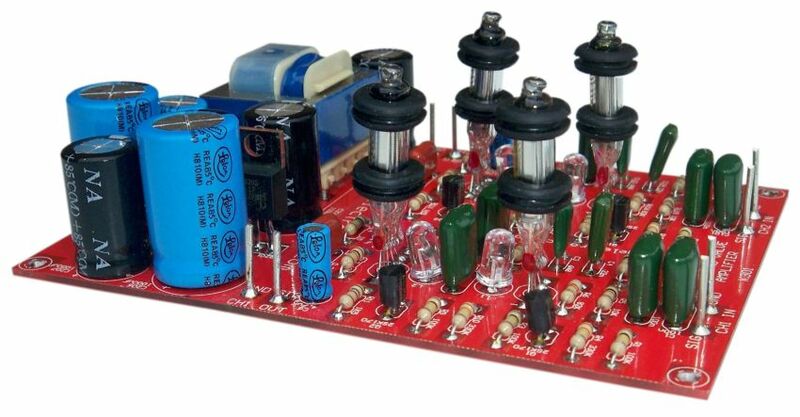 This pre-amp uses 30VDC. BTW: Thanks for editing in the pic! I have built two of the original kits and found both very good. Not just my opinion but a few audio club buddies really liked the preamp to. Wheather the SMPS or my DC version both performed extremely well. I made the comment to Oatley that some do not like SMPS and so he has made this kit. Also he has sourced some tiny power trannies. Not sure I would like 240V AC so close to the phono cct. though. Hi Mark, does the on-board transformer have any mechanical noise? Gio: I don't have the latest kit on hand to know. If it is the same Tranni as in the tube buffer and I'll bet $1,000,000 it is, it runs dead quiet. They are incredibly small and take 120 or 240V. Finally received the kit Saturday, May 7. Will start assembly this week. I'm going to give the designed PS a chance to prove itself. If it turns out too noisey, it goes bye-bye. The PCB traces are such that I can cut the PCB and separate the PS from the rest, but I would lose 2 mounting holes and there really isn't room enough to bore 2 new ones. We'll see how it goes. Paul sent 5 of the JAN6418 with the kit. This combined with the 10 I already have, I should be able to get 2 well matched pair and hopefully have a well-ballanced pre-amp. Most of the kit build is completed. I am now in the process of "tube matching". Oatley provided a procedure for doing that and it real straight forward - you're just measuring plate current draw. Of the 5 tubes provided, only 2 had a close match (2mA diff.) @ ~75mA. The remaining 3 were; 55mA, 66mA, and 110mA. As previously stated, I have 10 more that I have procured separately (via ebay). I will be testing those tonight. I want 2 closely matched pair, I have 1 so far. I don't care how close the 2 pair are matched.